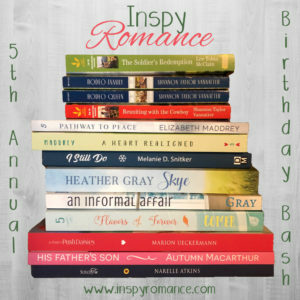 Our Inspy Romance Birthday Bash is almost here! 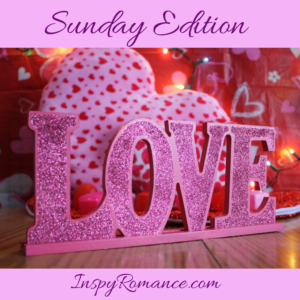 February is a big month at Inspy Romance. Not only is February the month when we celebrate love and romance, it’s also our birthday month. This year we’re celebrating our fifth birthday. Haven’t those those five years flown by fast! We have more than fifty books to give away in our Birthday Bash. Ginger will be sharing all the details in her Valentine’s Day post. I always find it a little bit weird to be posting the Sunday Edition toward the end of my Sunday (the post goes live at 8pm in my Aussie timezone). I’m spending most of today at a golf course with my son’s Special Olympics golfing team. I’ll be walking 18 holes in pleasant summer weather. By the time 8pm comes around tonight, I’ll be more than ready to go to sleep! What are your plans for today? Kimberly Rose Johnson’s winner is Lucy! Marion Ueckermann’s winner is Natalya! Melanie Snitker’s winner is Tracey H! January gift card winners are Virginia Jones and Jackie Smith! I’m ready for bed too. I had to make a walnut and fruit loaf (like almond bread) so it can sit for a couple of days before I slice it thin and then dry it out in the oven. I had one little cat yelling at me wanting me to feed her some. Sweet dream Narelle! Enjoy your summer. Looking forward to the Birthday Bash. Just trying to relax today and stay warm. Been a rough few weeks weather wise. First the Polar Vortex, then the warm temperatures making most of the snow melt and rain and flooding. The temperatures have finally stabilized but someone this old body can’t manage the 40 to 60 degree temperature changes. Best wishes. But I like to spend the day relaxing, doing laundry, cooking and reading! What a celebration it will be!!! Congratulations on 5 years here at Inspy Romance, that’s awesome! And congrats to this week’s winners! I appreciate winning a book from Melanie, thank you! Hi Narelle, can’t believe how quickly this year has gone- February and inspyromace birthday already!! We spent Sunday doing grocery shopping, washing etc. then did a loop around our nearby mountain bike tracks. I would love to walk in the sunshine 🌞. We went to church and now hubby is fishing. We are under a storm advisory for tonight. Blessings! Congratulations on five years. Hope the next five are just as great!